How did December get here so fast? More importantly, why are so many big name games releasing this first week of December? The Video Game Award votes have been tallied, so there’s no chance for any of these titles. Of course, many are remastered versions of games, so perhaps they never had a shot to begin with. In fact, the release of the week is a remastered title—The Last Remnant Remastered. However, while it is remastered, it never released on a PlayStation title before. At E3 2008, Square Enix shocked many in the US with the announcement of three Xbox 360 exclusive titles (they had previously been Nintendo and PlayStation staples): Infinite Undiscovery, Star Ocean: The Last Hope, and The Last Remnant. 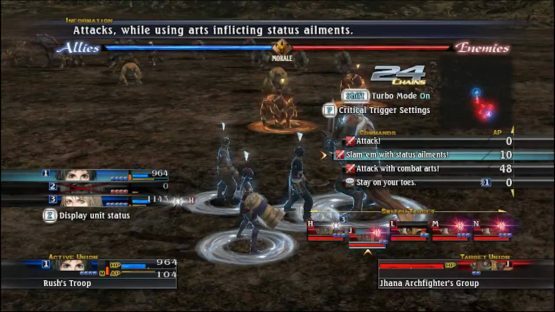 The Last Remnant later released on the PC in 2009 with a planned port to PlayStation 3. But, as I said earlier, that never came to fruition. For gamers who have only owned PlayStation consoles for the last couple of generations, The Last Remnant Remastered is certainly not remastered for them. It’s brand-spanking new. The Last Remnant was one of the most underrated JRPGs of last generation. It didn’t help that it was announced along with two very mediocre JRPGs of last generation. What made TLR so special was not the story, which was a bit of the typical JRPG fare. Its gameplay was, or is, rather, unique. It’s a combination of tactical turn-based and real-time strategy. That description is not doing it justice, but that’s the simplest way I have to describe it. Your party and allies could be divided into individual units to attack enemies or units of enemies. Unit placement could provide an advantage, such as with flanking, or your poor placement could result in you being flanked. Each battle is like a game of chess; it takes skill and finesse to get that killer setup on the board, and only one wrong decision for the tide to turn against you. Often when it does turn against you, it’s a brutal endeavor. Even if you do survive, you’ll most likely restart your last save since your party was mostly wiped out and you won’t survive another battle with who you have left. Suddenly I’m not so sure why I liked the game the first time around. This sounds hard. And it is hard! But once you find your particular strategy that works nine times out of ten, you’ll find the fun despite the difficulty. It’s fairly exciting that PlayStation fans will finally have an opportunity to try out The Last Remnant, even if it has “remastered” in its name. The Last Remnant Remastered will release only on PlayStation 4 on December 6, 2018.